The time between each frame is .1 seconds. Aaron Peirsol's time for this race was 1:54.95. Frame #1: The swimmer's left arm has entered with the hand oriented backward. This is a good feature because it contributes to the minimization of vertical force production. The right arm has completed its backward thrust and is at its deepest point. It is just beginning the inward and upward scull. The swimmer is streamlined well. The kick is relatively large. That is to be expected because male swimmers exert bigger forces with the arms that need to be counterbalanced by more forceful kicking. In addition, the distance between the center of gravity and buoyancy is usually larger in males than in females, necessitating larger kicking to halt the legs sinking. Frame #2: The left arm has begun to flex at the elbow and the upper arm has begun to medially rotate. This action orients the pull straight backward. The right arm sweeps upward on its path to extraction. The right leg kicks to counterbalance forces created by the left arm. Frame #3: The left arm continues to bend at the elbow, further medial rotation has occurred, and abduction begins. The arm is positioned to apply forces directly backward. The left leg is poised to kick to counterbalance right arm forces as the arm exits the water. The swimmer's streamline is still good. Frame #4: The left arm is abducted with the full surface (upper and lower arm, hand) oriented directly backward. The left leg kicks. Frame #5: Left arm abduction transitions into adduction. Drag-force turbulence begins to appear on the back of the hand and arm. Frame #6: The left arm continues directing force backward as adduction nears its limit of force production and the elbow begins to extend. Drag turbulence appears to have been left behind the hand and lower arm. It is not known why this occurs. The buttocks appear to have dropped slightly. The magnitude of kicking seems less than earlier in the stroke. Frame #7: Left arm extension occurs with the hand pushing back and down to achieve the longest stroke possible. Drag turbulence is obvious and remains in a consistent orientation to the hand and arm. However, the swimmer is moving past the position of the original turbulence noted in the previous frame. Streamline could be improved, but should not be changed if it results in a loss of force production by the propelling arm. Frame #8: The left hand completes its push, turns inward, and begins the inward-upward scull. The left shoulder breaks the surface as it leads the left arm recovery. The right arm enters. Frame #9: The right arm immediately orients backward, the elbow begins to bend, and upper arm abduction occurs. Drag turbulence begins to form on the right wrist. Frame #10: The right arm produces propulsive force from well behind the head. The whole arm is involved in propulsion. Frame #11: Abduction of the right arm nears completion as noticeable propulsion is developed. Frame #12: Right arm adduction drives the swimmer forward. The right elbow begins to extend. Frame #13: Right arm extension is almost completed, but some productive drag turbulence is still visible. The left arm approaches entry. Frame #14: A position similar to that illustrated in Frame #1 is achieved. 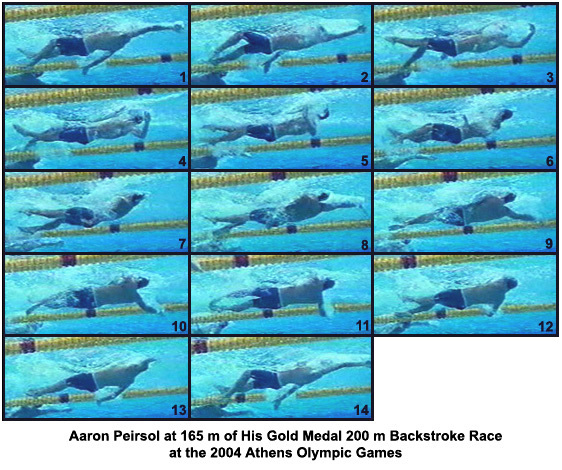 Aaron Peirsol demonstrates a long effective propulsive stroke. It is oriented to being directly backward, achieving its greatest depth at the end [something that occurs because of the human anatomy and not because of intention]. The whole arm contributes to propulsion, the mechanics being similar to those of a good crawl stroke. The swimmer' streamline is not as good as that demonstrated by many crawl stroke swimmers. It appears to be phasic. It is good at the start of propulsive arm actions and when the body is rotated to the sides. The buttocks appear to be lower when the arms are at the extremes of their movements (see Frame #7). No explanation is offered for this occurrence. The principal impression from this swimmer's analysis is his very long, effective underwater pull that generates considerable power by using the whole arm as the propulsive surface. Some experimentation with the position of the hips is warranted.